Dental injuries and tooth damage can happen at any time, it is best to stay calm and focus on stopping the bleeding. Our office provides after-hours emergency dental services to provide immediate treatment. We provide information below to help you while waiting to see the dentist. By following this information it can improve the outcome for your treatment and potentially decrease further complications. If your emergency is life-threatening, dial 911 for Emergency Medical Services or go immediately to a hospital emergency room. If you have mild tooth sensitivity, sore gums, or other dental issues that do not require immediate care, make an appointment with us for a checkup. These conditions do need to be treated however, they are not dental emergencies. If the conditions below require emergency care here are recommendations for each instance. Hold a cold cloth against your mouth near the sore tooth. Rinse your mouth with salt water to kill any bacteria and help reduce inflammation. If there is any food lodged near the sore tooth use dental floss to remove. You can apply an over-the-counter mouth numbing gel to the sore tooth and the gums. Applying aspirin or a pain reliever directly to your tooth can irritate the gum tissue and make the issues worse. Losing a tooth can seem alarming however it is best to remain calm and, remember that emergency dentists treat this kind of situation often. If you visit the dentist within an hour, the dentist usually will be able to re-insert the tooth and save it. It is best to pick up the lost tooth by the crown, rather than the root, to prevent any bacteria or other pathogens to the tooth root. If there is any debris on the tooth, rinse with cold water, but do not dry it on anything. Re-insert the tooth, making sure that it is facing correctly, and bite down carefully to keep it in place until you reach the dentist. If you cannot easily get the tooth back into its socket, store it in a container of milk. The emergency treatment process for a lost tooth involves cleaning the socket to remove any debris, and then re-inserting the tooth in its socket. Over the next couple weeks, the bone will fuse to the teeth and attach to the jaw again. It may be possible to reattach the pieces to your tooth – only your Dentist can tell you for sure. Rinse your mouth with warm water to clean it. Apply gauze to the area and use firm pressure to stop the bleeding. Try to find the chipped or broken tooth pieces right away. When the bleeding stops, apply a cold compress to the injured area to minimize swelling. If bleeding does not stop after 10 minutes of constant, firm pressure, see your dentist or go to the emergency room. 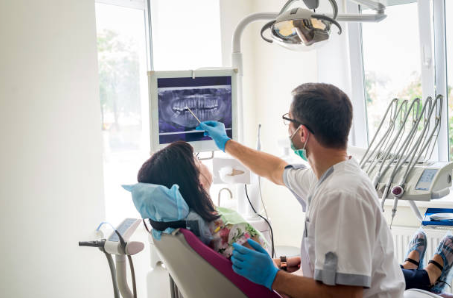 If you damage or lose a filling and do not experience intense pain, you can probably wait until your regular dental office is open to seek treatment. If you found the filling, put it in a safe place and take it with you when you see your dentist. If you suffer an injury to your mouth that results in excessive bleeding, it is recommended to visit the emergency room. The medical staff may need to stitch any cuts and will refer you to a dentist for any damage to your teeth. Until you reach the emergency room, you can control bleeding by placing pressure on the wounded area with a cold compress. Rinse your mouth with cold water to help reduce bleeding and keep the area clean. If you need prompt and affordable emergency dental care, request an appointment today by calling (702) 228-2218. The dental issues described above require immediate care and can prevent further complications if promptly treated.